How to become a Professional Knitter - Robin Hunter Designs: An Interview with ... Melissa McColl of LadeeBee Update! An Interview with ... Melissa McColl of LadeeBee Update! You can find Melissa here and here on Ravelry. Melissa's business is growing! Her original interview was one of the most read shop owners interviews. It seems appropriate with her recent growth to ask her some new questions and get an update on her adventures in the knitting industry. You can read her original interview here. You've moved into a new and bigger space, please tell us how that came about? I had been sharing a two level space with a lovely gift shop called Wise Daughters. She carried an array of handmade items by local artists, but unfortunately, she was unable to continue the business and had to close her doors. I was faced with the decision to close after only one year or carry on by taking over the entire location. 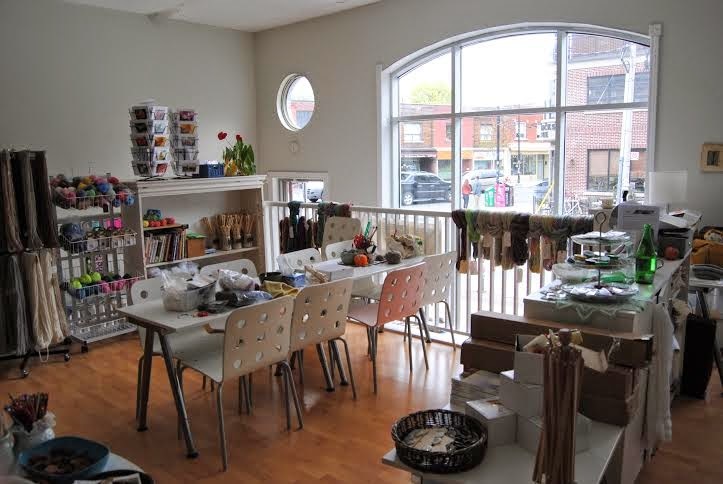 I could have found another spot to set up shop, but this is such a great space and we have a good established relationship with the owner of the building. After a year of operating in the lower level of Wise Daughters I felt confident that I could carry the space on my own. I really didn't even consider closing to be honest as I just don't see myself doing anything else. I felt that there was enough support in the community to sustain and continue to grow LadeeBee, so expanding seemed like the right thing to do. You run workshops for both adults and kids how do the challenges differ for each group? Adults may bring some challenges to the table when they come to a workshop. I can see that confidence often has to be fostered quite a bit . I think as we get older it just becomes harder to learn a new task. We have a lot of distractions in our lives and slowing down and relaxing to learn a new skill takes a bit of time. I find that anxiety can really hinder the learning experience, so I try to make students feel as comfortable and at ease as possible. Children on the other hand are quite accustomed to a learning environment and are asked to acquire new skills on a nearly daily basis. If there is any anxiety it doesn't seem to hinder them quite as much. Children will generally dive right in to the activity. If children are genuinely interested in the activity they will be very quiet and focused and determined to complete the task. You are offering a variety of workshops which include topics other than knitting, how do you describe your shop to potential customers? LadeeBee is a one stop destination for crafting inspiration. Because I enjoy a variety of crafts I have so many different departments in the shop. 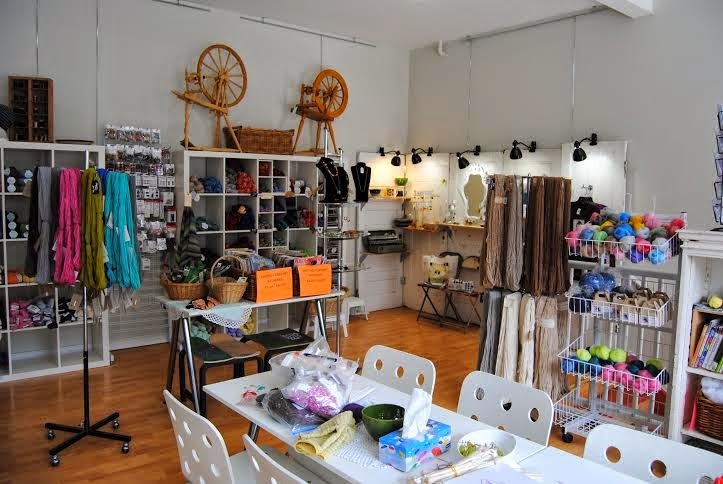 The main departments are yarn and beads, but in addition I carry supplies for cross stitching, embroidery, felting, spinning, and even a small section for handmade gifts. 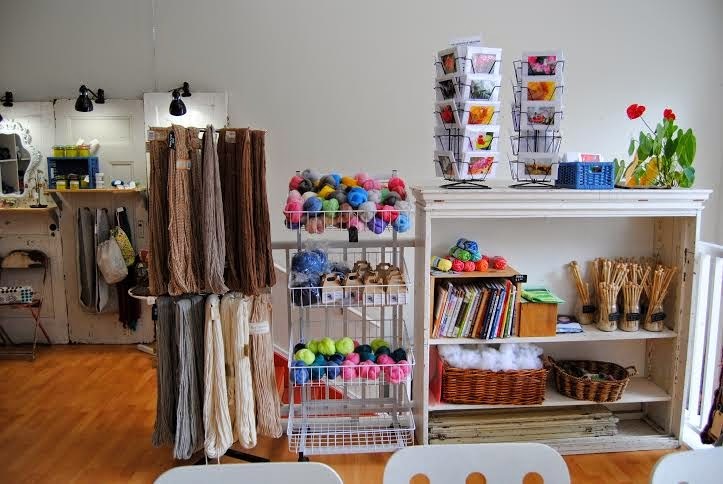 I think the shop is fun and cheerful and the idea is to assist my customers to scratch their crafting itch when they feel like making something. Is the shop equally split between the various crafts or is one more strongly represented? 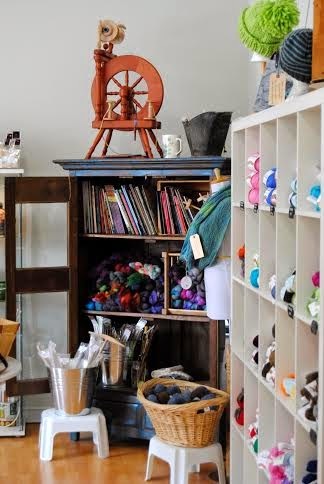 I would say at the moment that yarn and fibre has the most representation in the shop. There is potential to expand the beading department in the lower level to give each department more or less a 50/50 representation with other crafts supported minimally. Sundays are your Stitching Bee days, which are open to all craft pursuits not just knitting, is this event drawing in more customers for you? It's a really important event for me in many ways. The people that come regularly on Sunday are my core supporters. 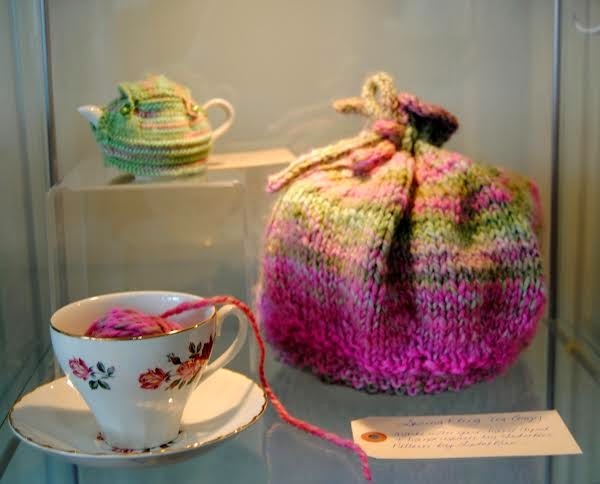 They offer this support by being my sounding board, generating activity ideas (such as the Mother's Day Tea Cozy Exhibit), they were there to help me set up when I expanded, and they are a nice group for me to engage with socially. I think its nice for other customers to see the shop active and busy so it brings a positive vibe to the shop. It doesn't necessarily bring in new customers directly, but as you can see it is an important group. Could you tell us a little about upcoming workshops that are being planned? We always run a beginner knitting and crochet course on alternate months. This month we are running a beginner crochet course. Coming up we have an embroidery workshop, needle felted gnome workshop, a pendant making class, wet felted bowls, beaded bracelets with memory wire, crochet booties, a top down knitted raglan cardigan course, a seaming techniques class for knitters, and a crochet floral necklace workshop. Phew! As you can see we like to have some core classes for knitters and crocheters with some jewelry making and other needlework workshops as well. Every month we will have the different crafts represented in this way in our programming. ETA Melissa has invited me to teach an introductory lace knitting class on June 14 1 - 4. It will be added to her website soon.